Officially, International Falcon Reservoir), located on the Rio Grande River in the South Texas Counties of Zapata and Starr, was impounded in 1954. Built for conservation, irrigation, power, flood control, and recreational purposes, Falcon is one of the largest lakes in Texas with a surface area of 78,300 acres at normal level and a maximum depth of 110 feet. Falcon would cover 87,000 acres at the conservation level of 301.20. At the average lake elevation of 257' elevation during drought or extreme draw down conditions, Falcon covers 23,344 acres. As a sport fishery, Falcon boasts a great history of big catches. Largemouth bass grow large and mean in the long South Texas warm water seasons. If you want to get a jump on the spawn in Texas, this is certainly the place to be. 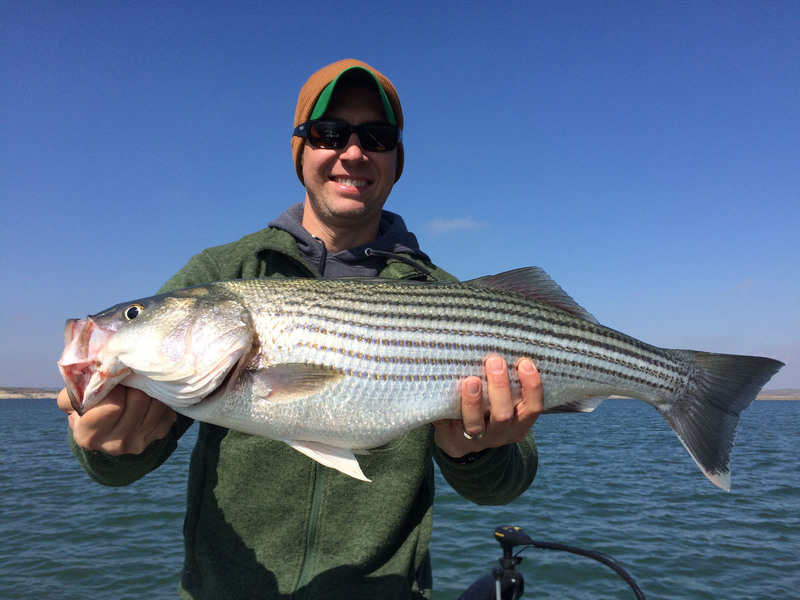 Striped bass have done well in the past in Falcon's warm water and were a secondary angling attraction for a number of years. However excessive netting pressure from Mexican commercial fishermen together with frequent fish kills during summer low oxygen periods have substantially impacted the striper population. And as of mid 2009, we have not heard of a striper being caught out of falcon in at least three years. South Texas is famous for great cat fishing, and Falcon is no exception as she offers excellent fishing for channel, blue, and yellow catfish. Populations of crappie and white bass have been sharply reduced due to overfishing, mismanagement and low lake levels. They no longer exist in fishable numbers. We are making an effort to reestablish these species, and TPWD stocked 1.17 million white bass fry in spring of 2009. Catfish has replaced the striped bass as the secondary fish and for many local fishermen, this good eating fish is the primary species. Large yellow catfish (flatheads) populate the lake and river. In the fall, river holes are favorite flathead destinations, especially at night, and live shad are the bait of choice. Sixty to eighty-pound fish are not unusual, but the larger cats are less prevalent than in the past. This is attributable to Mexico commercial fishing pressure and spotty enforcement of illegal netting on the US side by Texas Parks and Wildlife Department. But in the last few years we have finally gotten a decent number of wardens here on Falcon, and enforcement is making a difference. While Falcon has a few challenges, her strong points and advantages strongly out weigh any of the negatives. If you like to catch lots of fish and get away from the crowds you have likely found at other destinations, Falcon Lake is an excellent choice for an inexpensive vacation. Since the Mexican border literally runs through the middle of the lake, you can enjoy great food and a unique fishing experience with a quick day trip into Mexico. However, it is not necessary to make a trip to Mexico to view aspects of their ancient culture. There some remarkable relics to be seen and artifacts such as arrowheads are found in many of the lake's areas that were inhabited by native Americans thousands of years ago. The old town of Guerrero Mexico (now mostly underwater) still has the original Church viewable from the Salado Arm of the lake. The Falcon Lake area is known for low fishing pressure, great Sunsets with a view of the mountains in Mexico on clear days, good fishing success, and very nice people. A very mild and dry winter climate and the earliest natural largemouth bass spawn in Texas make Falcon an excellent choice for winter RV getaways. Several lakes in Mexico offer additional fishing potential including Sugar Lake, Las Blancas Lake and El Cuchillo. Falcon State Park provides access, boat ramp, and camping areas that range from tent spots to sites with hook-ups for electricity, water and sewage. Facilities include 24 shelters (12 air-conditioned, 12 screened), campsites with water, electricity, and sewage; campsites with water and electricity; campsites with water; restrooms with showers; a fish-cleaning shelter; playgrounds; a trailer dump station and a group recreation hall with kitchen for day-use or overnight-use. 3 miles of hiking/mountain biking trails make a complete loop around the park and signs detailing plant life provide a 1-mile self-guided nature trail. There is a boat ramp with three 24' lanes that works beginning at 262' elevation. For lake levels below 262' (like we have had the majority of the time for the last 10 years), the park has no ramp and your options include launching from the rocky shoreline or driving to Zapata and launching off one of the concrete ramps at the Zapata County facility. Several Lodges also provide launching facilities, but forget Zapata launching at elevations below 250.50'. Four-wheel drive is recommended for temporary ramp use at the State Park. Sometimes changing lake conditions cause the temporary ramps to be unusable; if in doubt, contact the park. Nearby points of interest include Lake Casa Blanca and Bentsen-Rio Grande Valley State Parks, Falcon Dam, Nuevo Guerrero, Fort Ringgold in Rio Grande City, the City of Roma and its many historical sites including the Roma Historical Museum.